Few days back, while searching some good read at our online office portal, I accidentally came across this book. Main content of this book has been written in Persian poetic form. Translations of this book in different languages are available including Urdu. The version I came across was translated by Mr Zaid Hamid. Although I have much ideological conflicts with Zaid Hamid but still, the translation can be catagorized as good read. 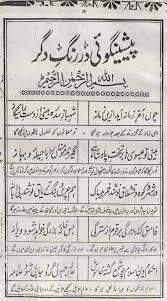 Nemat Ullah Shah Wali was a pious man centuries before. He basically wrote a sort of Trans-Literature. I won't call his subject matter as prediction because of the reason that finality rests in the hands of Allah. Secondly what a saint can see is just a fair illusion of the happening but in actual scenario, these illusions are altered by Allah Almighty in the greater interest. He starts from Mughal Empire and goes till the arrival of Jesus Christ. All events come up in an order of their happening. Most of the scenarios described in the couplets happened in reality but not all. Rise and fall of Mughals, British Government and then creation of Pakistan are the main events to be mentioned. Then he described the age of looting and hypocracy in Pakistan. In this era, he especially mentioned the role of hypocrate learned scholars. He ended up the tale with the happening of Ghazva-e-Hind and arrival of Imam Mehdi followed by arrival of Jesus Christ. Qudrat Ullah Shahab also mentioned few of his predictions in his autobiography named Shahab Nama (شہاب نامہ). The point of writing this review is to spare some time for this book as well. Finality rests in the hands of Allah.